This dialog displays an outline of the available Common Graphics/Integrated Development Environment documentation and much general Allegro CL documentation. Double-clicking on a leaf item (i.e. 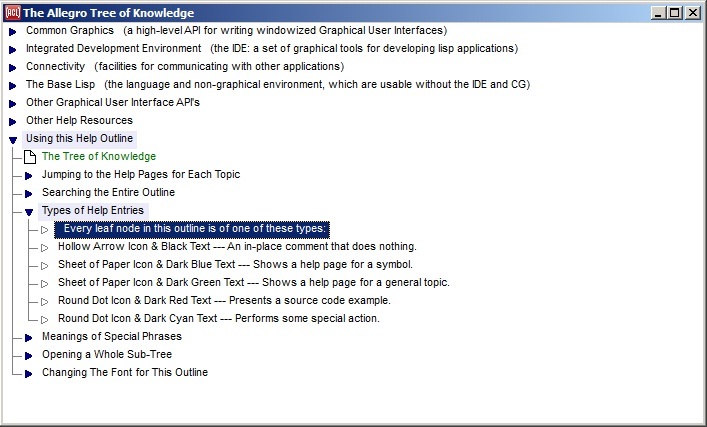 one that does not have subitems), or pressing the SPACE bar or the F1 key while the leaf item is selected, displays the relevant documentation, typically the relevant page in this help file, but Navigator examples are also displayed by some leaf entries. The Search | Find Forward or Search | Find Backward command in this dialog opens the outline as necessary to find all relevant entries and highlights them. The entries in the tree are identified by various icons. In the illustration, the tree entry Using this Help Outline | Type of Help Entries is open and describes the visual clues provided by the icons. This dialog is displayed with the Help | Tree of Knowledge menu command.